NAFTA negotiators from the United States, Canada and Mexico are poised to miss the deadline this week cited by House Speaker Paul Ryan, the latest blown marker for reworking the 24-year-old deal. 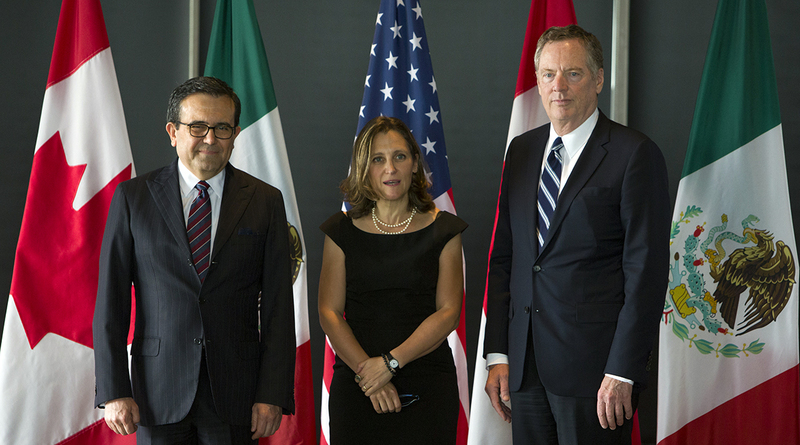 U.S. Trade Representative Robert Lighthizer, Mexican Economy Minister Ildefonso Guajardo and Canadian Foreign Affairs Minister Chrystia Freeland aren’t scheduled to meet together in person this week, according to three government officials familiar with talks who spoke on condition of anonymity. The trio met at least bilaterally every day last week. U.S. President Donald Trump and Canadian Prime Minister Justin Trudeau addressed the talks in a phone call May 14 — with the White House saying that Trump pushed for a quick deal while Trudeau’s office said they discussed the “possibility” of one. The Trump administration is increasingly preoccupied with its efforts to reach a peace deal with North Korea and avoid a trade war with China. Vice Premier Liu He — who is President Xi Jinping’s top aide for economic matters — will be in Washington this week for talks with the administration on ways to resolve the trade dispute between the countries. Lower-level NAFTA talks will continue and could yield a breakthrough and a ministerial meeting, but none has been scheduled so far, according to the people. The three officials said the representatives could meet next week, or later in the month. Chief negotiators are scheduled to hold a conference call early this week to assess the status of the talks and whether a ministerial meeting is feasible later this week, one of the people said. While the negotiators will keep in touch by phone, the lack of a face-to-face meeting after such a big push last week would show how far apart the sides remain on updating the North American Free Trade Agreement. Ryan injected a sense of urgency when he said lawmakers need notice of intent to sign a deal by May 17 so they can vote before this Congress ends in December. The Canadian dollar reversed gains to trade down 0.1% at C$1.2813 per U.S. dollar, while Mexico’s peso extended its losses, falling 1% to 19.6232 per dollar at the May 14 close. Although Ryan’s comments put the firmest deadline yet on NAFTA talks, many analysts have said U.S. deadlines are murky and that a deal reached later in May or even in June theoretically could get passed. A spokeswoman for Ryan, AshLee Strong, said the May 17 target is due to timelines set out in U.S. trade law, not an arbitrary political date. “This is not a statutory deadline, but a timeline and calendar deadline,” Strong said by e-mail May 11. Whether Lighthizer could seek to notify Ryan by May 17 of his intent to sign, without an actual deal in place, is somewhat unclear. Lighthizer cited the House speaker’s deadline to pressure his Canadian and Mexican counterparts during a trilateral meeting May 11, according to two sources familiar with the talks. Trump’s trade chief has indicated he needs a deal this month but hasn’t publicly identified a particular day. Emily Davis, a spokeswoman for Lighthizer, referred to a written statement he released May 11 when asked for comment May 14. In it, Lighthizer said talks have “covered a large number of very complex issues” and the United States “is ready to continue working with Mexico and Canada to achieve needed breakthroughs on these objectives.” The statement made no mention of a deadline. Former Mexican President Vicente Fox said Mexico will only sign on to a good NAFTA deal, otherwise it could withdraw and pivot to expanded trade with countries such as China, Argentina and Brazil. Freeland was in Mexico City on May 14 for talks on Venezuela and hasn’t said if she will meet Guajardo privately there. In a sign of the dimming odds for an imminent deal, Guajardo and his team told dozens of stakeholders from Mexico’s private sector they should return home from Washington because no breakthrough was expected, according to two sources familiar with the meeting. Stakeholders from all three countries are canceling or delaying visits to Washington this week, four other sources familiar with the talks said. The existing NAFTA remains on the books unless a country withdraws, which would require six months notice. No country has given that notice, though Trump has threatened to do so. On May 11, the president called NAFTA a “horrible disaster” for the United States. Lighthizer has said the political calculus for passing a new NAFTA would change if it had to be voted on by the next Congress. Mexico and Canada have downplayed the urgency to reach a deal this week. The countries have been holding periodic discussions since August. Talks have focused recently on the auto sector, but big gaps remain. Even if the sides agree on auto rules, they remain far apart on other issues such as a sunset clause and dispute-settlement panels. Aside from U.S. trade law timelines, Mexico’s election will be held July 1 and looks set to usher in a new president who could seek changes to anything not finalized. With assistance from Andrew Mayeda.